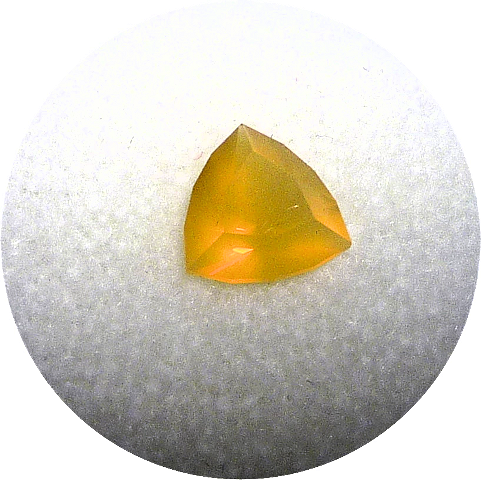 Somehow I keep faceting stones despite having a few hundred under my belt. So I'm going to be selling many of the less expensive stones. These have all been cut by ME, which means that they have few to no inclusions (if they do I say so), a near-perfect to perfect polish. The photos are as good as I can get them with my camera, and tend to pick out every tiny smudge and speck of lint (I'll throw those in for free lol). They magnify everything and make them look TERRIBLE as compared to what you will see. They all appear perfect or nearly so even under magnification. These photos are something like 10 times life size to show them at their best. Virtually all of them have good to excellent scintillation ("flash") but some of them are not designed to be flashy and I say that if it's the case. Dimensions are the widest / narrowest of the stone from girdle to girdle (the "equator"). Note that ALL of them are custom cuts, I don't cut any of the common commercial designs because quite frankly most of them are simplistic and boring. Not to mention cut by sweatshops in Asia which is very shoddy work. 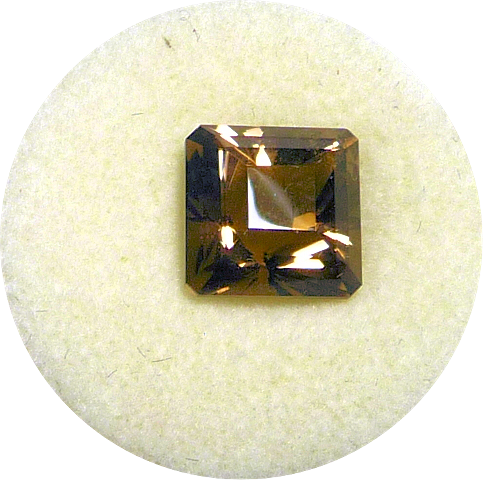 (Once you get to know quality faceting take a 10x loupe to a jewelry store and look at how terribly cut many of the stones are). 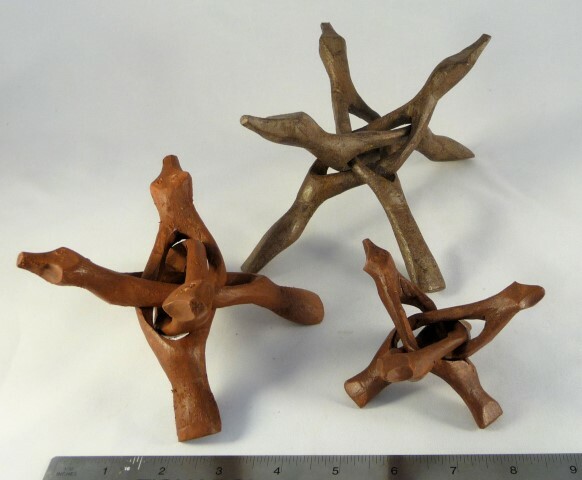 They may or may not be suitable for setting in rings, earrings, pendants, etc. and if I say "may fit" it's because I don't know what sizes are commercially available. It will definitely be the right shape for the setting. You might have to get a custom mounting since I don't force the stone into a commercial shape, which is also quite silly. 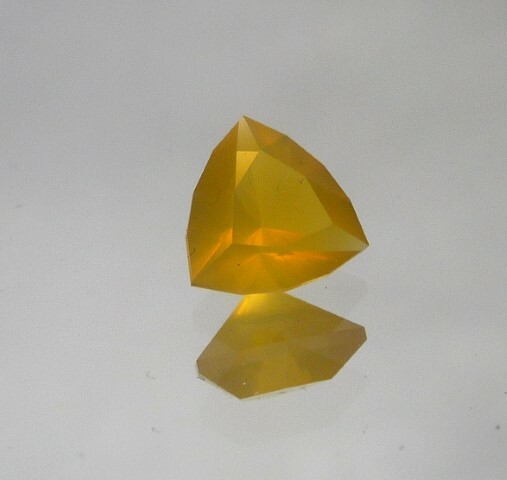 I cut stones based on the best shape for the rough stone, or a particular design that I have in mind. I have priced them well below what I could sell them for elsewhere, my goal is to get them into the hands of people who will appreciate them. I consider my cost of the rough material and the size of the stone. 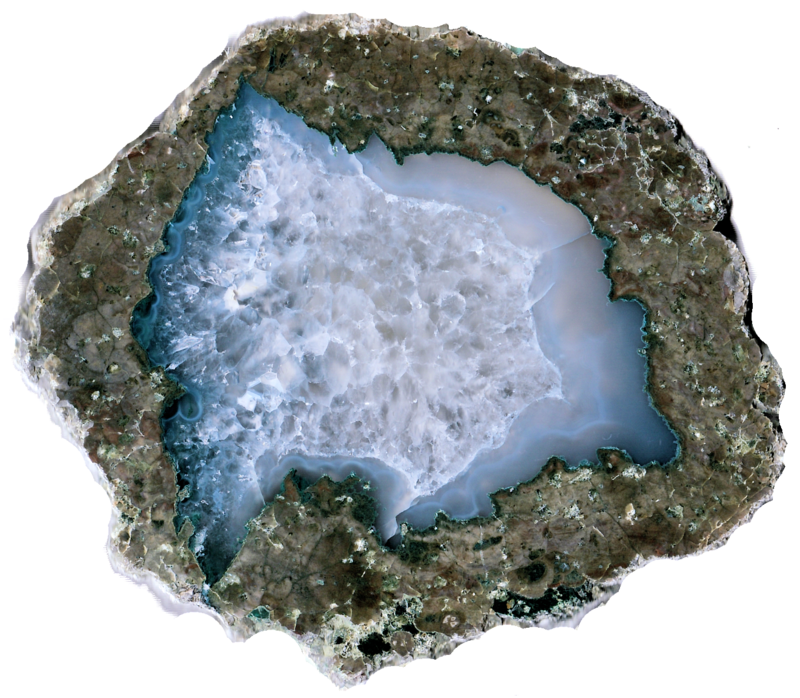 I facet many natural amd man-made stones and I say which they are. I am just being totally honest about what you are looking at here, I've seen too many shoddy stones, mischaracterized, or flat out fakes posted online. You would be frightened by the number of fakes I can easily spot on the popular selling websites, and I probably am not catching 90% of them. Anyone can make a convincing "certificate of authenticity" with a scanner, photoshop and a printer. All stones will be sent via trackable first class mail. If you want insurance for the full value of the stone please let me know. I've never had a package lost so I don't think it will be a problem, and Paypal insures both you and I for the full value against loss or damage in shipping. 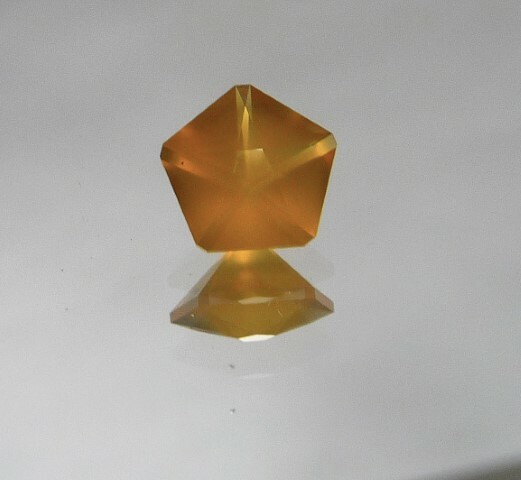 Click on the cart next to the price to purchase a gemstone via Paypal. I accept electronic payments or credit cards via PayPal. If you have a PayPal account, would like to set up an account, or would like to use their one-time transfer feature without signing up for an account, please feel free to try the shopping cart by clicking the cart button next to each item. I will bill S&H charges to your PayPal account once I have your order ready to ship. You MUST unblock cookies and popups for the PayPal site to work! Please note: I have a minimum order of $25 before S&H charges. If you've recently visited this page, be aware that your browser may have cached the images and although all browsers are supposed to catch new images and reload them, sometimes they don't. So hit the refresh button below just in case to make sure you have the lastest pics. Go to the url address: about:config. This should load the Firefox config settings in the window for editing. You may see a warning message stating, "This might void your warranty!" that will require you to click through to load the settings (there is no warranty anyway lol). Then search for browser.cache.check_doc_frequency key and change it to 1. For those of you who are looking for something specific in my for sale pages, I might have a solution for you. 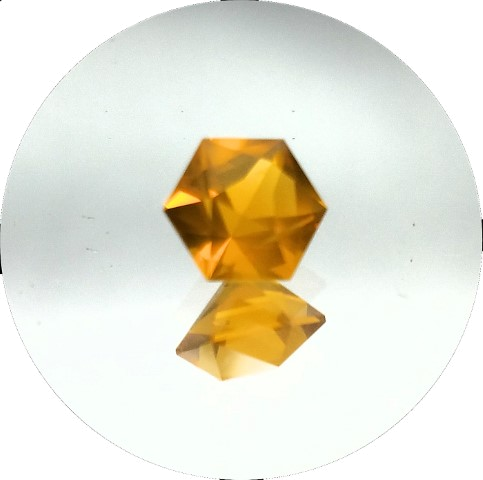 You may want to try this: https://www.changedetection.com, I think all you do is sign up and enter the address of the page, for example if you are looking for gemstones enter http://orerockon.com/Faceted Stones 1.html, and they should send you an email when I add something. BUT, it probably will send you a notice when I change one letter of one sentence on the page, so you might get annoyed by it at some point. It's a great way to track when I list new polished items, since I typically don't change anything until something sells and/or I add items, and equipment, which I never change unless I add new pieces or change the status to "sold" as they sell. I wil bill shipping charges later through Paypal. Stones will be sent via trackable first class mail. Tourmaline (closed C-axis) "Smith Bar"
Juniper Ridge opal is both rare and hard to get good enough quality pieces for faceting. I live in Oregon so I occasionally stumble on decent lots, most of which are 90-95% cabochon material. That other 5-10% can give a unique orange glow and/or red-orange flash if cut properly. It's slightly silky so it really glows. Opal is hard enough to be worn as jewelry but I'd save it for special occasions. It may fit in a standard 5 sided setting. 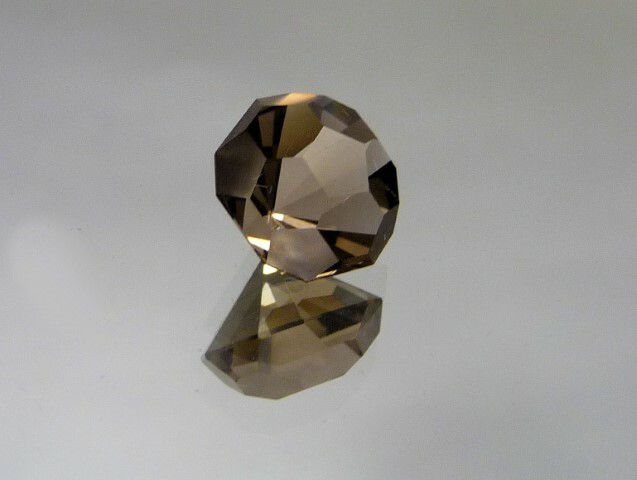 The stone is patterned after a soccer ball, and the top and every other facet are left unpolished to make the illusion work.This is a novelty cut but it's a big showy stone so if you had it custom set it would make a stellar pendant. It's probably big enough to wire wrap. Quartz is tough as nails and can be worn everyday. 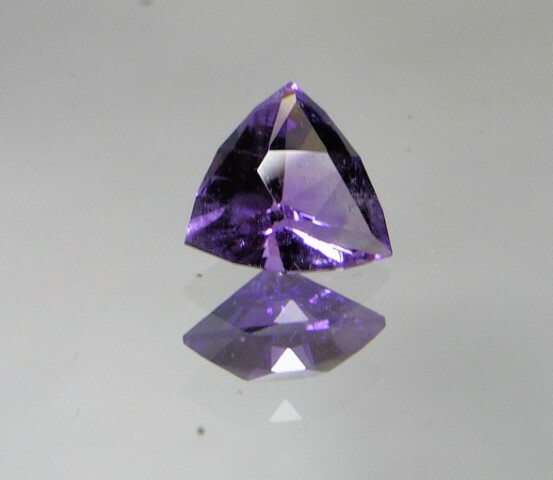 This design is really flashy and works great in amethyst. It may fit in a standard triangle setting. Amethyst is tough as nails and can be worn everyday. 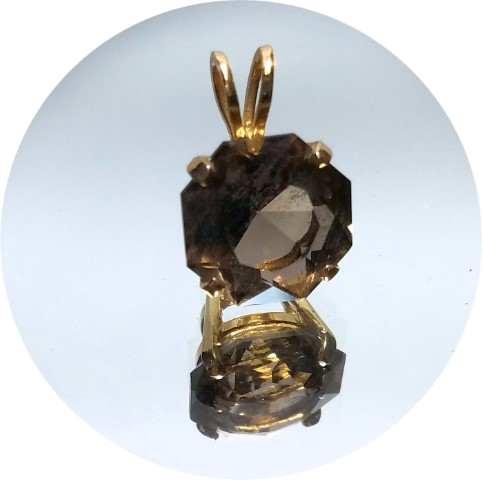 10.7 mm octagon set in a 14 karat solid gold basket pendant. I cut this stone and had it set for a gift, then changed my mind. The setting is worth more than the price ($80). I bought it when gold was half the price it is now lol. It is MUCH lighter than the photos, it's hard to photograph in the setting. Quartz is tough as nails and can be worn everyday. 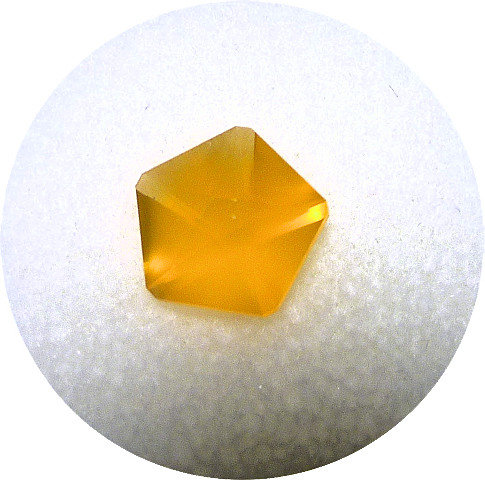 Uruguay Citrine Quartz "Aperture Science"
I like this color of citrine so I cut quite a bit of it. Root beer comes to mind. 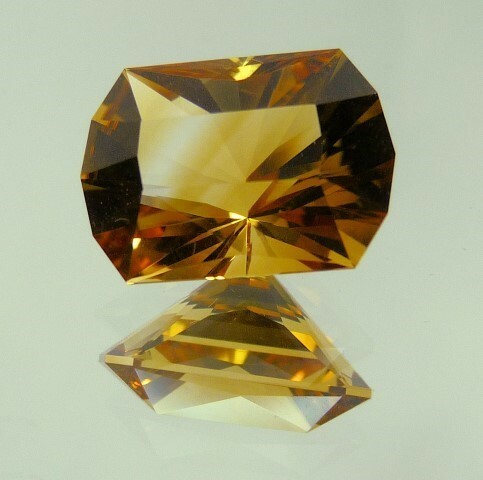 Very very flashy cut and the citrine color occurs in wispy bands. I like these designs in horizontal pendants or broaches, anything that shows them off. All quartz is very hard and can be worn in just about anything. It may fit in a standard emerald setting. 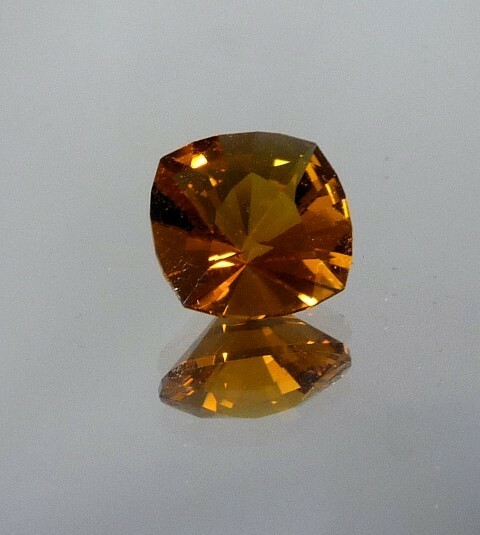 A slightly lighter shade than a lot of this gemstone. All quartz is very hard and can be worn in just about anything. It may fit in a standard square setting. 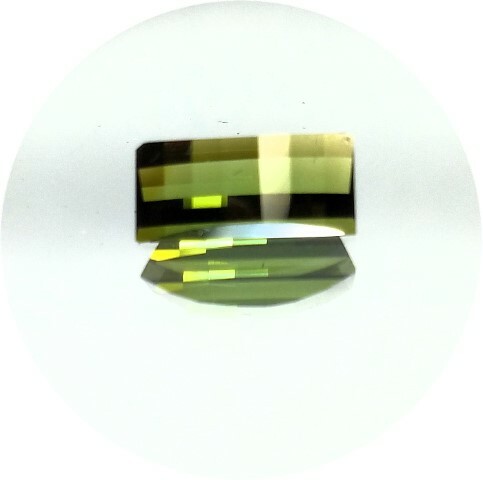 Color Change Borosilicate "Jolly Rancher"
Borosilicate glass is "laboratory glass", it has excellent optical properties, is chip and scratch resistant, but is NOT meant for everyday wear. "Color Change" means it changes colors depending on the lighting. This is taken under daylight fluorescent lights where it shows a pale green. In incandescent light it's a pink-orange shade. In natural daylight it's a mix between the two (which sounds ugly but it isn't lol). There is one veil that crosses the stone from lower left to upper right. You can't see it with your naked eyes. Much of the costume jewelry you see is this glass. This design really does look like a flashy piece of candy and is almost as big. Would look killer in a horizontal pendant or broach. It may fit in a standard emerald setting. Rose de France "Mock Emerald"
Rose de France is a fancy name for light amethyst. I like it more than amethyst because it has more transparency so has greater flash. 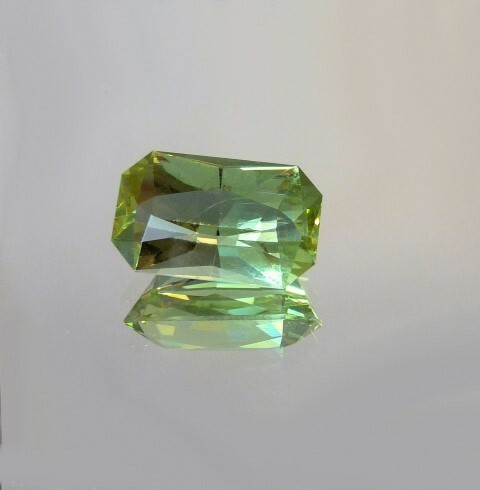 It may fit in a standard emerald setting. Amethyst is tough as nails and can be worn everyday. Juniper Ridge Opal "Easy Does It"
Juniper Ridge opal is both rare and hard to get good enough quality pieces for faceting. I live in Oregon so I occasionally stumble on decent lots, most of which are 90-95% cabochon material. That other 5-10% can give a unique orange glow and/or red-orange flash if cut properly. It's very slightly silky so it really glows and has some orange flash. Opal is hard enough to be worn as jewelry but I'd save it for special occasions. It may fit in a standard 5 sided setting. "Bubblegum" Synthetic Corundum "Triaga Light House"
Nice flashy big stone. Really unique look. 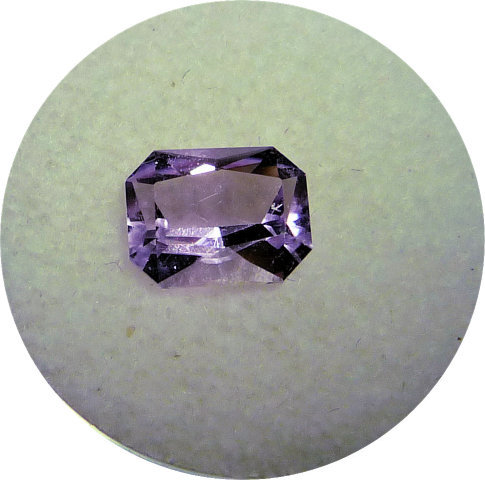 This is "Choklaroski pulled corundum" which translates into synthetic corundum (sapphire, ruby, etc.) for the rest of us. 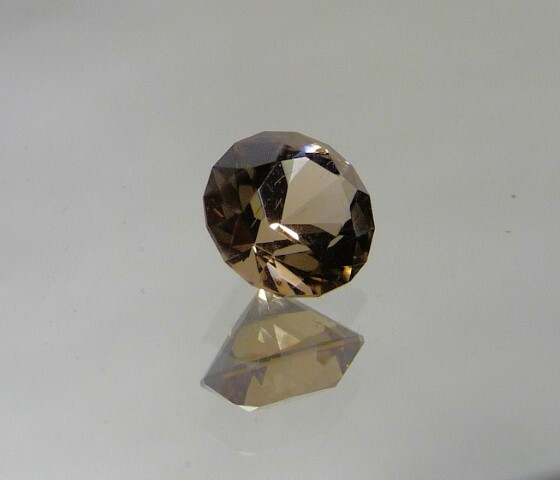 It comes in various colors and "bubblegum" is meant to simulate a pink tourmaline. 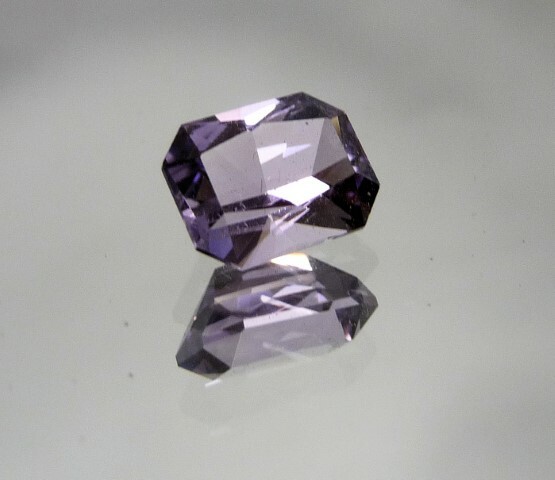 Corundum is almost as hard as diamond and can be worn in just about anything. 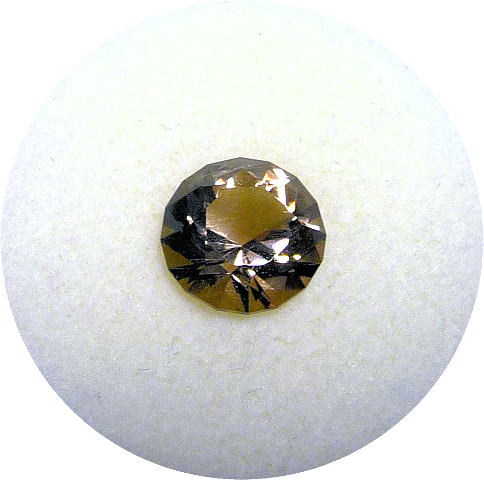 I don't cut too many brilliants (and never the standard commercial brilliant, which I detest), but Smoky looks nice in a round stone. It may fit in a standard round setting. Quartz is tough as nails and can be worn everyday. There is so much man-made CZ out there it's ridiculous (just watch 10 seconds of JTV lol). But none in this design. 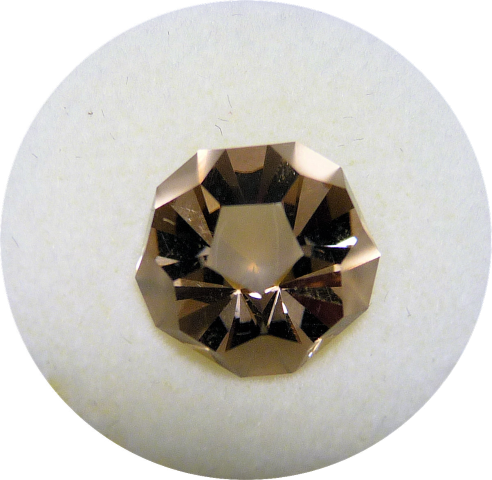 Originally meant to simulate diamond it is known for very bright scintillation. This one is no exception, and has great "depth" (think of a funnel). I haven't cut much of it yet but it's starting to grow on me. A fairly hard stone and can be worn in just about any situation. Juniper Ridge opal is both rare and hard to get good enough quality pieces for faceting. Did I mention that I love cutting this? I live in Oregon so I occasionally stumble on decent lots, most of which are 90-95% cabochon material. That other 5-10% can give a unique orange glow and/or red-orange flash if cut properly. Opal is hard enough to be worn as jewelry but I'd save it for special occasions. 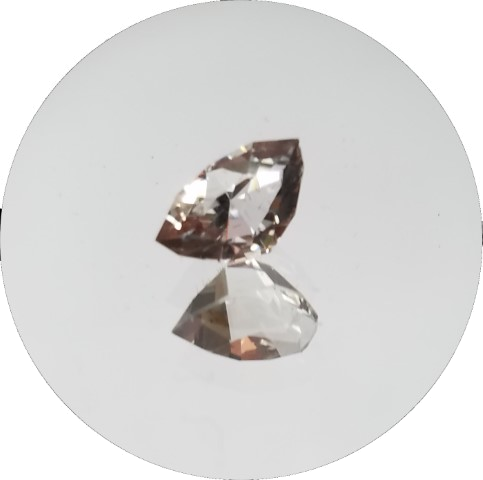 I love white topaz because it gives a brilliant pure white flash (brighter than most diamonds) if cut properly. The barion design gives it an extra "kick". Topaz is hard enough for everyday wear. 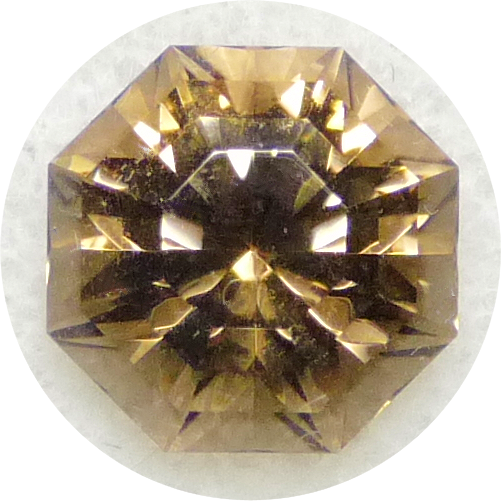 The stone is an ususual square barion design. Barions have small facets on the bottom that provide a lot of scintillation. 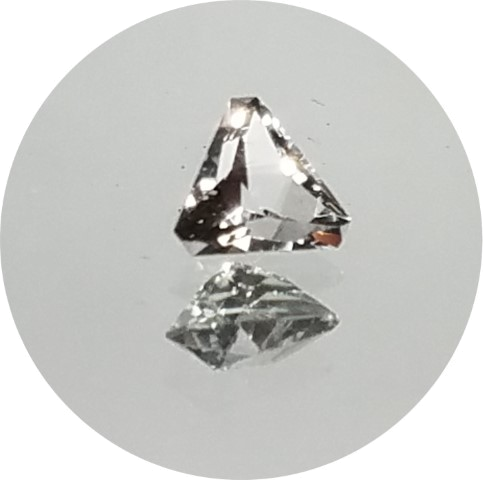 Barion cut diamonds are becoming very popular and that's for a reason. This would make a showy pendant. It may fit in a standard sqaure setting. Quartz is tough as nails and can be worn everyday. There is so much man-made CZ out there it's ridiculous (just watch 10 seconds of JTV lol). But none in this design. 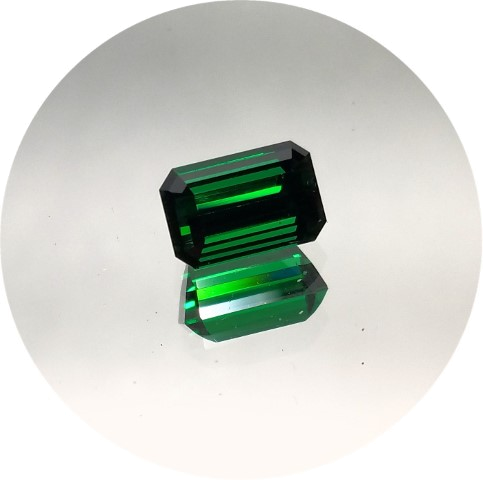 This color is meant to simulate emeralds. It's very flashy for am emerald design. I would have it set horizontally in a necklace which would be perfect for this stone. A fairly hard stone and can be worn in just about any situation. This design has big bright flash and really does look like a butterfly's wings when you rock it (if you use some imagination). 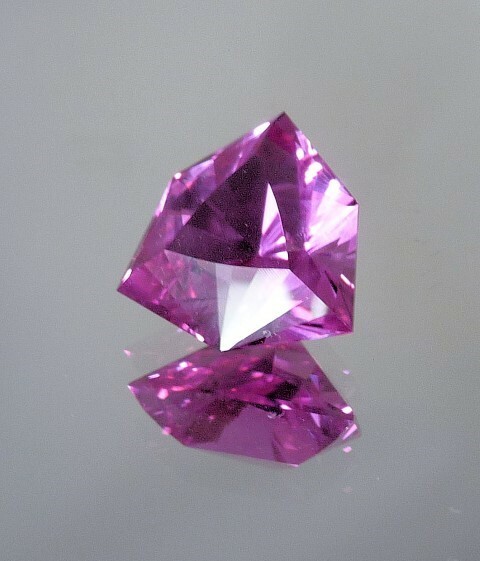 This is "Choklaroski pulled corundum" which translates into synthetic corundum (sapphire, ruby, etc.) for the rest of us. 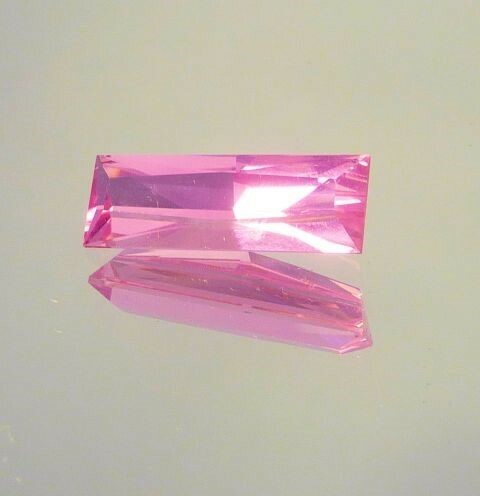 It comes in various colors and "bubblegum" is meant to simulate a pink tourmaline. 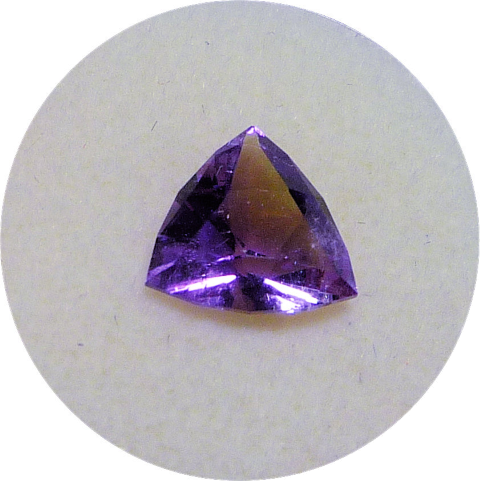 Corundum is almost as hard as diamond and can be worn in just about anything. 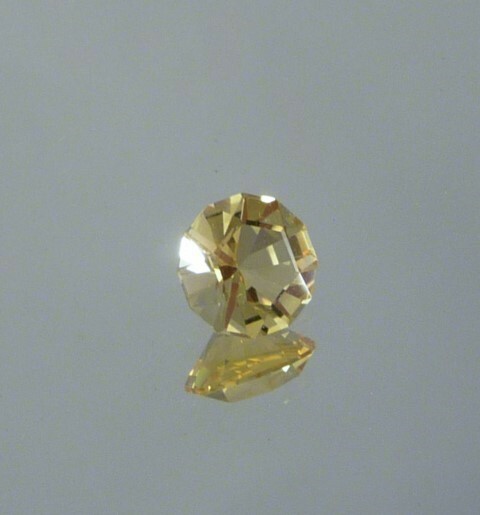 This quartz stone is from Herkimer, New York, and is famous for its brilliance and perfect clarity. It's called "diamond" for the resemblance, but it's a quartz crystal. The design is just about unknown, even among faceters. 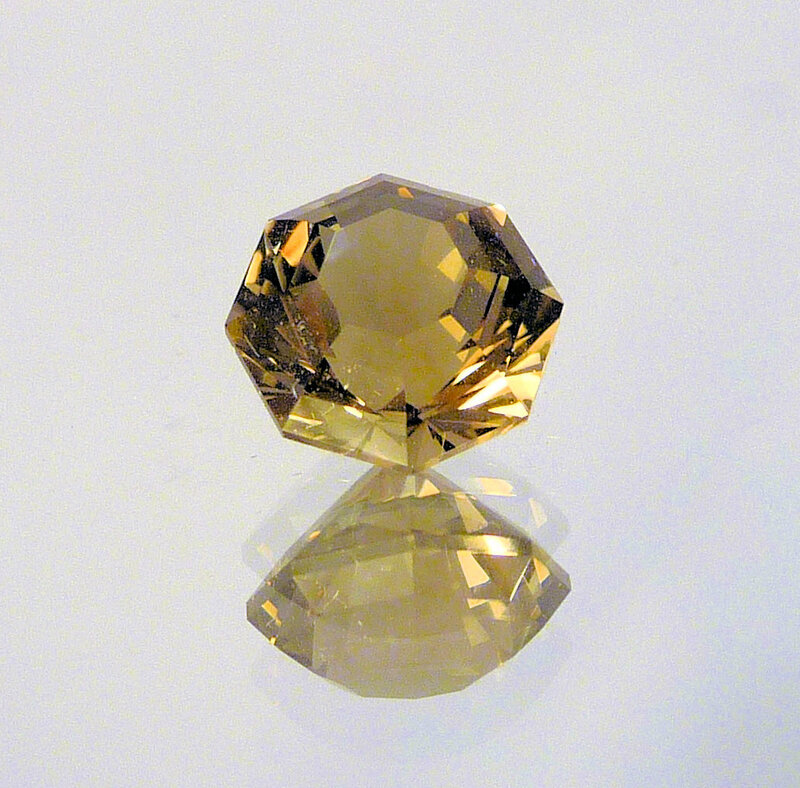 It mimics the natural shape of many Herkimer crystals. All quartz is very hard and can be worn in just about anything. 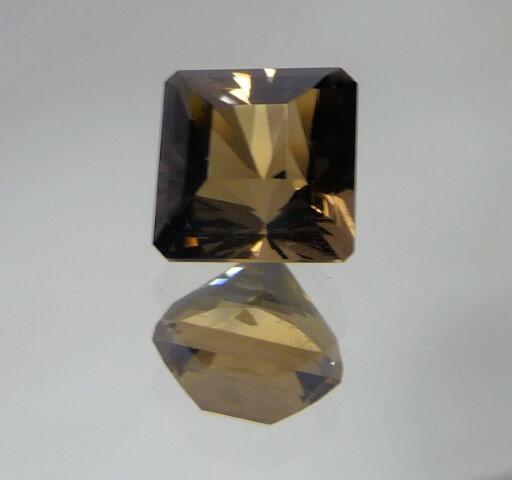 Smokey quartz is a natural color, but crystals light enough to make good faceted stones are pretty hard to find. This has great brilliance and the octagonal table is very noticeable. Suitable for everyday wear in any jewelry. Please note: I have a minimum order of $25 before shipping charges. ALL OF YOUR QUESTIONS ARE ANSEWERED HERE. If you have a question about ordering see this section. S&H charges will be applied and billed separately. PLEASE READ MY POLICIES HERE BEFORE YOU ORDER! By ordering from this site you are agreeing to all the stated policies on the linked page. I accept electronic payments or credit cards via PayPal only! If you have a PayPal account, would like to set up an account, or would like to use their one-time transfer feature without signing up for an account, please feel free to try the shopping cart by clicking the cart button next to each item. I will bill S&H charges to your PayPal account once I have your order ready to ship. You MUST unblock cookies and popups for the PayPal site to work! If you don't want to use PayPal, please EMAIL ME at the address above. You MUST have a valid email address to use PayPal! Do not ever email anyone your credit card number! If someone asks you for it, they are attempting to steal it! If you email me your credit card number, it will likely be stolen since one of tens of thousands of bots will probably intercept any email that looks like it has a credit card number in it. I wouldn't know what to do with it anyway, that's what PayPal is for. OreRockOn Rock Dig Locations DVD VERSION 6.0! Users may download this World Wide Web page for personal use only. Unauthorized copying or distribution of this page or any of its contents without the express permission of the author is expressly forbidden.